Residents at Strathallan Estate claim they were not consulted about new festival venue which could damage wildlife. A Scots couple have threatened legal action over the new T in the Park festival site amid fears over the well-being of local wildlife. Mark, 53, and Kim Liddiard, 56, who have lived in their home on Strathallan Estate for eight years, said they have not been consulted about the new venue. They also said they only found out about the move through media reports. T in the Park, which attracts 85,000 revellers each year, is moving to the 1000-acre estate in Perthshire after safety fears were raised over a pipeline at Balado. The couple, along with other residents in the 30 homes on the estate, feel that the festival's move could have a "significant effect" on local wildlife. The picturesque area is teeming with wild animals, including bats, nesting ospreys and kites, while the Machany Water is an important site for wild salmon spawning. Mrs Liddiard said: "It was a real shock to us. We were really concerned as to what was going on. Nobody had a conversation with us. "There's real concern the Machany Water is going to get severely damaged. The reason some people come to the area is for wild salmon fishing. "We've got nesting ospreys on the estate. They would also be disturbed by a concert. There are a number of protected animals. We can watch ospreys, kites and skylarks. There are also bats and otters." David Summers, from the Tay Salmon Fisheries Board, said: "The Machany Water is indeed a salmon spawning stream. We would like to know what things are planned around the stream and what precautions would be taken to ensure there is no pollution. "The concern would be if there was waste from a large number of people on the site. They would have to be confident that precautions in place would work." 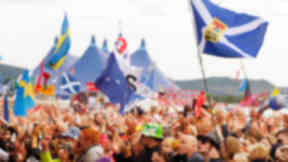 Festival organisers DF Concerts have not been required by Perth and Kinross Council to lodge a planning application for the annual event. Any landowner can temporarily change the use of their land if it is for less than 28 days in a year without needing planning permission unless it has a "significant effect on the local environment". The Liddiards have now written to Scottish ministers asking them to review the situation and are prepared to take the matter to the Court of Session for a judicial review. Sandy Telfer, head of planning at DLA Piper Scotland, said: "The last thing that our clients want to do is to derail T in the Park. "They and the significant number of other local residents who are concerned about developments at Strathallan are only too aware of how iconic an event it has become in Scotland. "The problem is that they have no idea how the festival will impact on their personal and professional lives during the six to eight weeks in the summer of each year going forward that it takes to set the site up and take it down at the end of the three days of live music." A spokeswoman for Perth and Kinross Council said: "Planning permission would be required if the event, including assembly, dismantling and clean-up of the site is expected to last more than 28 days in any calendar year or if there is a requirement for the formation or widening of any access to a trunk or classified road. "However, even if planning permission is not required, event organisers still have to apply for all of the required licenses to host the event and go through the standard approval process. "An Environment Impact Assessment (EIA) screening has been conducted at the identified site; this concluded that any environmental impact from the event was unlikely to be significant and therefore the screening opinion issued was that an EIA is not required." 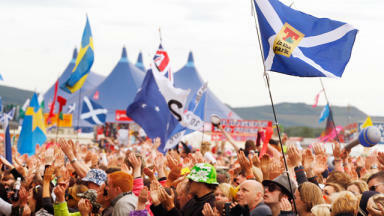 A spokeswoman from T in the Park said: "Building a positive relationship with the local community in Strathallan is extremely important to us. In the short timescale we've had, we've written to, spoken to and met with as many of the residents closest to the new site as we can and this process is ongoing. "We also invited many local residents, elected representatives and members of the community council to visit Balado this weekend, conducted tours and arranged meetings with senior members of the T in the Park management team. "The feedback we've had so far from the people we've spoken to has been extremely positive and this has established excellent foundations for going forward. "The fact that the Kinross community is so sorry to see the festival go will give an indication of the incredibly warm feeling and the huge benefits that the event brought to the area. We want to build similar relationships in Strathallan."